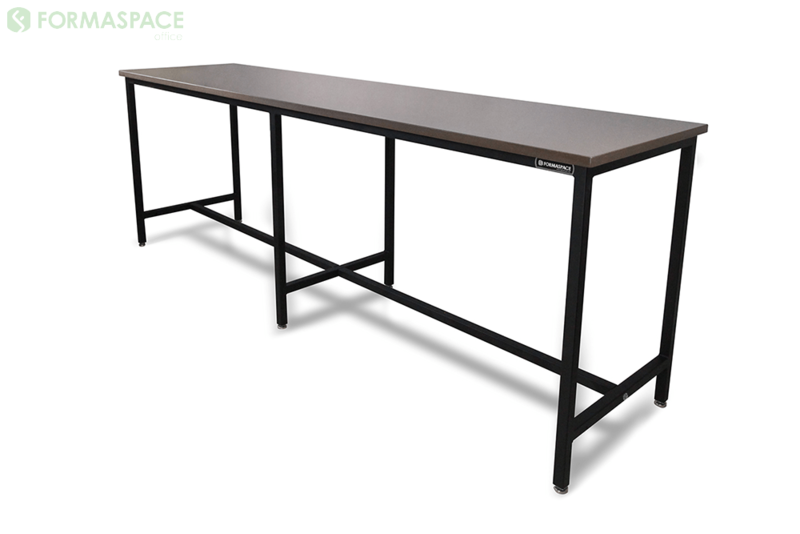 Choose Formaspace Office to build your next set of custom conference tables and desks, manufactured right here in the USA at our Austin, Texas factory headquarters. We can create fully custom (bespoke) furniture, such as our #NETworking Ping-Pong Conference Table. You can also extensively customize furniture orders from our standard catalog offerings, using our free, easy-to-use, online design tool found here on our website. Are you looking for something to inspire a little friendly competition and employee engagement at the office? Then it’s time to check out our new #NETworking Ping-Pong Conference Table. Our #Networking table was a big hit in the Formaspace Office booth at this year’s NeoCon contract furniture show in Chicago, where show attendees lined up to get a chance to play in an impromptu tournament. As Thomas Edison said, perspiration is the greater part of becoming a genius — and our guest table tennis players certainly felt invigorated and refreshed after playing a fast round of table tennis. Flip down the metal ping pong net, and you have a 5’ x 9’ conference table. Or you can separate the big table into two smaller, mobile collaboration tables. Use your Bluetooth-enabled smartphone to set the height of the work surface — from seated table height to standing bar height. The A&D community is on the lookout for truly differentiated, authentic, and unique furnishings, such as Formaspace Office’s #NETworking Ping-Pong Conference Table. It comprises two 54” x 60” African Mahogany solid wood tops that the connect together in seconds to create a regulation-sized ping pong table, with matching solid wood paddles. Unique details include vintage-style industrial casters, distressed hex bolt detailing, and cordless electric lifts that can raise the table height to 56” using any Bluetooth-enabled smartphone. Think about how you could use a #NETworking table at your office. It’s more than just a ping pong table. 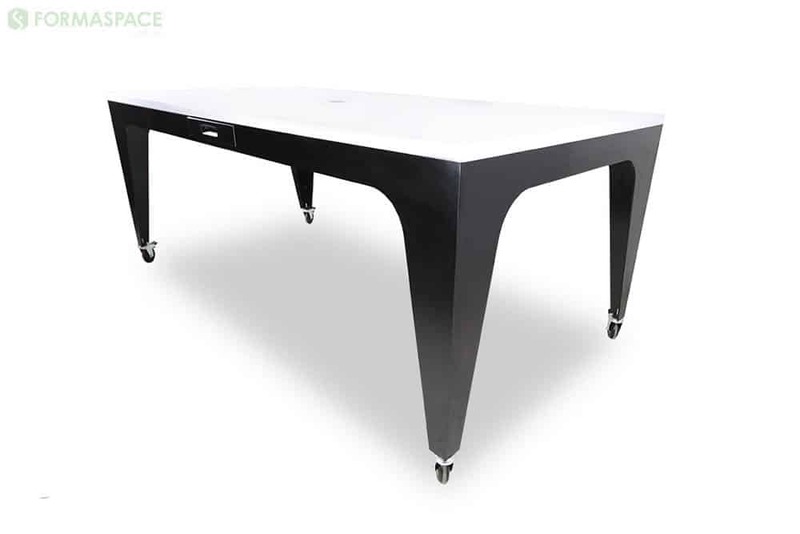 With one piece of incredibly flexible furniture, you can collaborate around a single, large, conference table; host a reception or pitch a presentation by breaking the table into two smaller, height-adjustable tables; or quickly convert your conference room into a fun game zone for your workers to play against each other in friendly table tennis tournaments. We’d like to congratulate Real-Self, the cosmetic surgery experts web platform based in Seattle, who recently purchased two of our #NETworking tables. Real-Self was looking for a way to give back to their hardworking employees, and the #NETworking tables were the perfect solution. Real-Self’s functional workspaces can be converted into an exciting game zone in just seconds. Formaspace Office customized the #NETworking table design finishes to match the design elements in the Real-Self office; we also incorporated their logo and name into the perforated net design. As a bonus thank you, we celebrated the furniture delivery with Texas-style Taco party for their 150 employees. Remember, it’s important to have fun at work! If you are thinking about creating a game zone within your office to encourage employee collaboration and engagement, we have the perfect complement to our #NETworking Ping-Pong Conference Table. Custom Shuffleboard Gaming Table by Formaspace Office made its debut at NeoCon 2017 in Chicago. The gaming surface is a live-edge slab of pecan wood fitted with leather inserts surrounded by custom brass detailing. The custom steel frame, powder coated in Textured Black, is inspired by one of Austin, Texas’ favorite landmarks, the Penny Backer Bridge. The table includes a built-in custom abacus, modular phone and drink trays, and a battery-powered USB charging port. Take a moment to consider all the important visitors — including your major customers, investors, analysts, and members of the press — who are ushered into meetings held inside your conference room. 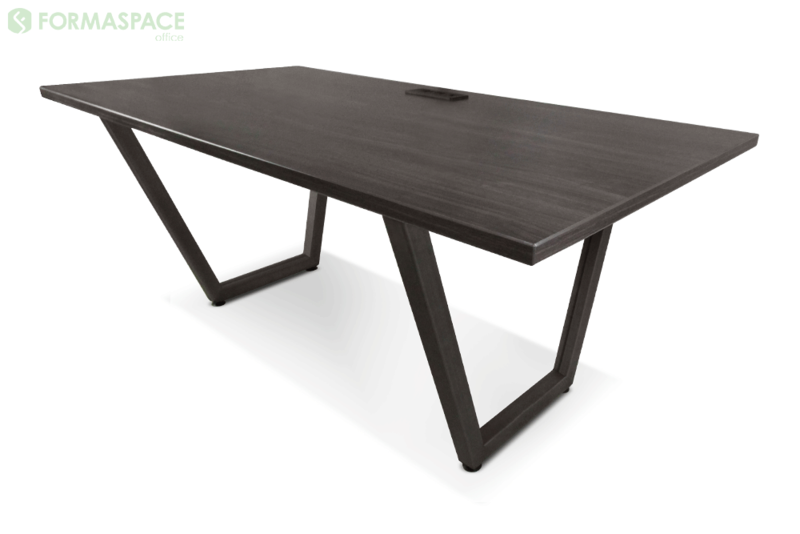 Make a good first impression with our hand-crafted, Trapezoidal Conference Table. The luxurious solid walnut surface is an impressive ten feet in length. The trapezoidal design provides more comfortable viewing angles for meeting participants, who don’t have to lean forward to see presentations. Use your Bluetooth-enabled smartphone to raise the table to standing height or lower it back again to desk height. And all those messy, unsightly cables and adapters associated with today’s electronic gadgets are gracefully hidden underneath — allowing you to maintain a pristine, clean surface that shows off the fine walnut hardwood surface. However, when you need access to audio video connections, electric plugs, and the like, simply press a button, and the hidden, motorized console rises up from the center of the table to reveal a complete set of power plugs, USB and HDMI access ports, and LED light controllers. There is also ample built-in storage for remote controls and the like. This design offers many opportunities for customization. For example, the console end caps can showcase branding elements (logos, etc.). The perforated custom steel panels underneath the worksurface light up from behind, and they can also be customized with your logo or brand imagery. Speak with your Formaspace Office Design consultant today about ways to customize this and any of our other products to meet your exact needs. Remember, if you can imagine it, we can build it, here at our factory headquarters in Austin, Texas. So far, we’ve shown you three pieces of bespoke furniture that were designed by our Formaspace Office in-house team of industrial designers. We’re happy to offer design services to you to build custom furniture just for you. But we’re equally happy to be your custom manufacturer as well. We can work with your architect or designer to build bespoke furniture products that meet your exact specifications. We’d like to present an example of how this works in practice: Formaspace Office recently hand-crafted two identical bespoke tables for the PGA Tour, the famous professional golf tournament association based in Ponte Vedra Beach, Florida. We worked directly with the PGA Tour’s designer and furniture dealer, who created a very striking table design that features an industrial-look metal base with a high-contrast, all-white Corian top. Both of these signature tables are used in prominent public areas of the golf tournaments where merchandise is displayed or meals are served. They also double as collaboration tables for use in meetings. 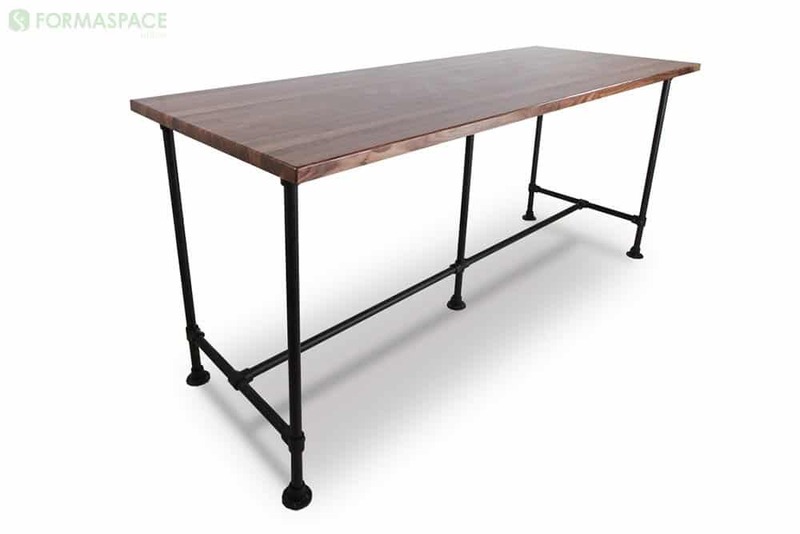 Using the designs provided by the designer and the dealer, Formaspace Office was able to craft the two table frame bases out of heavy-duty, fully-welded, 16-gauge solid steel; we then gave them a long-lasting, semi-gloss black finish. Finally, we custom fitted all-white Corian worksurfaces with a 1.5″ build up and an eased edge. Each of the finished tables measures 8 feet long by 4 feet deep. Are you interested in bringing your furniture design ideas to life? Let Formaspace Office be your competitive advantage. We can build your custom furniture — whether you want one or two units, or a large quantity order filled. Of course, not every interior design project requires fully bespoke furniture designs. Yet, even when we order furniture offerings from the standard “catalog,” we always want the opportunity to customize our furniture orders to some degree — by choosing our favorite combination of worksurface shapes, base designs, materials, surface finishes, and so forth. Did you know you can make these custom furniture choices right here on the Formaspace Office website? It’s easy and intuitive. In just a few seconds, you can create photorealistic renderings of your design choices, then modify them by changing colors and materials, or adding select accessories. Check it out for yourself: Launch the Formaspace Office 3D Configure tool now. How does it work? It’s as simple as 1, 2, 3. Choose your furniture product and then customize it on screen. And, starting in early October, we’ll make it even easier to design a conference table. You’ll be able to pick a top design first, then pick a base design, then select your materials and finish. Want to see some real-world examples? Let’s take a look at four recent furniture pieces we created for customers that you can configure online using our Formaspace Office 3D Configure tool. Here is our first example of the type of custom furniture you can create using our 3D Configure tool. 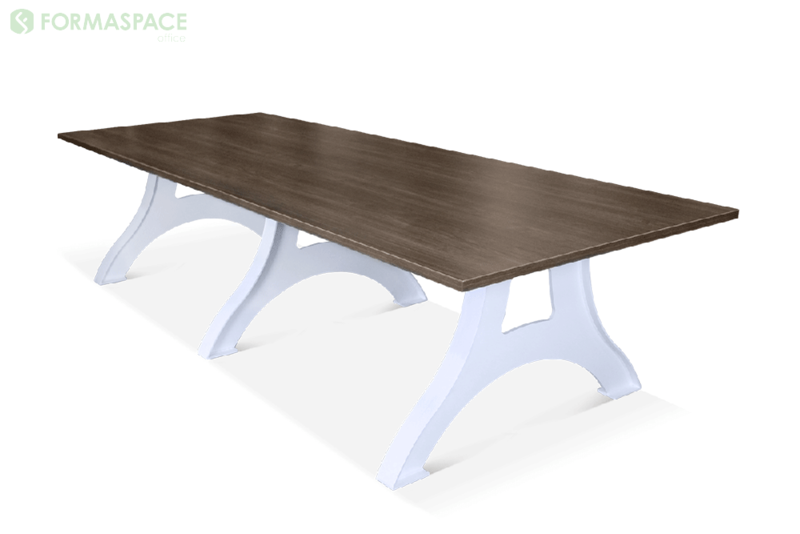 This rectangular conference table features a 192″ long Florence Walnut laminate top. It’s supported by three 46-inch “Eiffel” frame bases that are finished with a gloss-white powder coating. The result is a striking, vintage-look design at a cost-effective price. In our second example, the customer started with a 72″ x 36″ worksurface finished with a Florence Walnut laminate surface. As the customer wished to use this as a desk in a private office, they customized the order to include a rear surface cutout in the back for housing two power outlets, two USB jacks, an RJ45 data jack, and a 108” power cord. Next, the customer chose two metal “V” frame bases; this gives the design a refreshingly modern look that gives a nod to Mid-Century Modern design language. Finally, the design as manufactured by Formaspace Office is compliant with BIFMA (Business and Institutional Furniture Manufacturer’s Association) guidelines for product safety and environmental impact. Our third example of custom furniture is being used in a social setting at a community center within a large condominium facility. The long rectangular surface is crafted from Silestone in an Iron Bark finish. This easy-to-clean surface is ideal for serving hot or cold food and drinks. The top surface is supported by 6 legs made of steel, finished in a textured black powder coating. The bar height surface allows people to gather and talk with friends and neighbors, either standing next to the table or seated at bar stools. The table design also lends itself to use as serving buffet for potlucks and parties. Our fourth example illustrates how making subtle design choices can really change the character and functionality of your furniture. This bar height collaboration table has a very different look than our previous example. 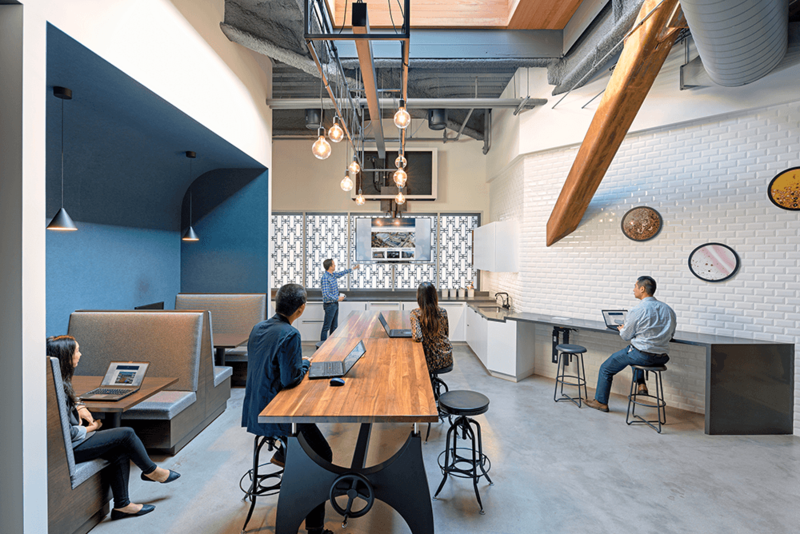 It was ordered by a software company in Northern California that wanted to add more collaborative space for employee gatherings and impromptu meetings. This customer chose a top surface that is made of walnut it’s 96″ long, 36″ wide and 1.5″ thick. Underneath, the collaboration is supported by a steel pipe frame that gives it a cool vintage, industrial look. There is also crucial design detail in the middle that’s worth pointing out: the middle of the table is supported by a single pipe leg in the center (rather than a two-leg frame) — providing a more generous knee space when people are seated at bar stools around the table. We hope these real-world furniture examples have inspired you to take a look at what Formaspace Office has to offer. We look forward to working with you, your dealer, your architect, and your designer to build on your creative ideas — from ideation to installation. Working together, we can create differentiated, authentic, unique, problem-solving furniture solutions — for your large and small conference rooms, private offices, co-working spaces, makerspaces, cafes, lounges, laboratories, industrial environments, K-12 schools and universities, and beyond. Formaspace Office strives to make great work environments. Our team is committed to innovative design, healthy ergonomics, environmental sustainability, and social responsibility. To learn more, contact your Friendly Formaspace Office Design Consultant today. You’ll be glad you did. Why Does Your Office Need a Makerspace?